Exam Cram will run from Dec. 3 to 9 at the GRCC library! You’ll be fueled by free snacks in spaces set aside for quiet and group study. You can also take a crafting break and learn to weave from 11 a.m. to 2 p.m. Dec. 5. Noon to 12:30 p.m. Dec. 3. On Dec. 8 and 9, the library will be open from 10 a.m. to 10 p.m. with drop-in tutoring sessions for some subjects. You can also ask to have your library fines waived during this time! GRCC’s library will maintain its regular hours — — 7:30 a.m. to 9:45 p.m. Mondays through Thursdays, 7:30 p.m. to 5 p.m. Fridays and 10 a.m. to 2 p.m. Saturdays — through Dec. 14. Starting Dec. 15, the library will be closed on Saturdays. It will close from Dec. 22 to Jan. 1 for the holiday break. It will be open from 8 a.m. to 5 p.m. Jan. 2 to 4. Starting Jan. 7, the library will resume its regular hours: 7:30 a.m. to 9:45 p.m. Mondays through Thursdays, 7:30 a.m. to 5 p.m. Fridays and 10 a.m. to 2 p.m. Saturdays. GRCC’s library will maintain its regular hours — 7:30 a.m. to 9:45 p.m. Mondays through Thursdays, 7:30 p.m. to 5 p.m. Fridays and 10 a.m. to 2 p.m. Saturdays — through Nov. 19. On Nov. 20, the library will be open 8 a.m. to 5 p.m. It will close Nov. 21 to 25 for the Thanksgiving break. The Learning Center’s open house on Tuesday was a tremendous success. Students, faculty and staff enjoyed refreshments while visiting the departments in the building: the library, Academic Support and Tutoring Services, the Woodrick Center for Equity and Inclusion, and Media Technologies. Free food, music and prizes will be part of the Learning Center’s open house on Nov. 13. The Bob and Aleicia Woodrick Center for Equity and Inclusion. Academic Support and Tutoring Services. If you’re on campus and forgot some “essential something,” the GRCC library has got your back! A student supply kit (scissors, pens, notecards, etc.). These items are in addition to the books, video and textbooks typically found on Course Reserve. Just call the library’s circulation and Course Reserve desk at (616) 234-3872 to see if the item you need is in stock for lending. The laptop vending machine at Tassell M-TEC. GRCC is expanding the number of campus laptop vending machines, making the free technology resource available to more students. 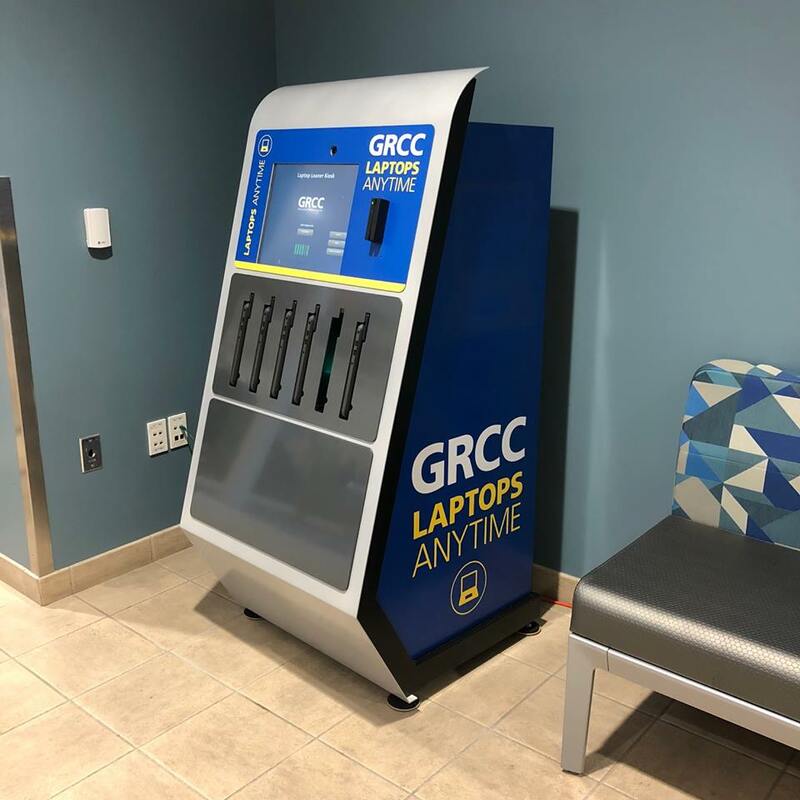 In a pilot program last year, GRCC installed a machine that dispenses laptops for up to four hours of use without charge in the Student Community Center’s counseling area. More than 500 students checked out laptops, logging about 660 hours of use. On level G2 of the Main Building — 12 laptops available. At Tassell M-TEC — six laptops available. By the Counseling and Career Center — six laptops available. The Grand Rapids Community College Foundation provided funding to purchase the additional equipment. To use the vending machines, you enter your last name on the touchscreen and then swipe your RaiderCard. You can use them for four hours. When you’re finished with your work, insert the laptop back into the machine, where any information left on it is wiped clean and its batteries are charged for the next user. 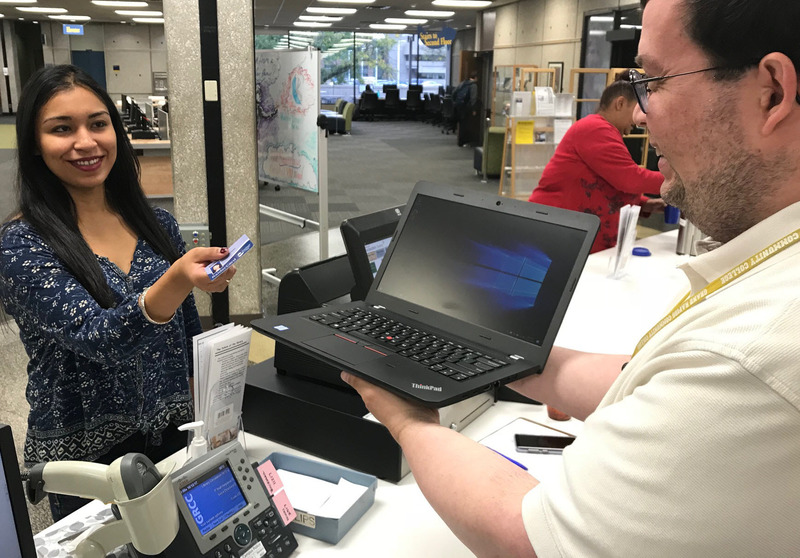 You can also borrow laptops from the GRCC library’s circulation desk. ATC Tutorial and Open Computer Lab, room 215 in the ATC, is open 7:30 a.m. to 10 p.m. Mondays through Thursdays, 7:30 a.m. to 9 p.m. Fridays, and 7:30 a.m. to 4:45 p.m. Saturdays. Sneden Computer Lab, room 215, is open 7:30 a.m. to 8 p.m. Mondays through Thursdays, and 7:30 a.m. to noon Fridays.